Age is presumably the essential factor in determining how humans sleep. Sleep patterns evolve in complex ways. 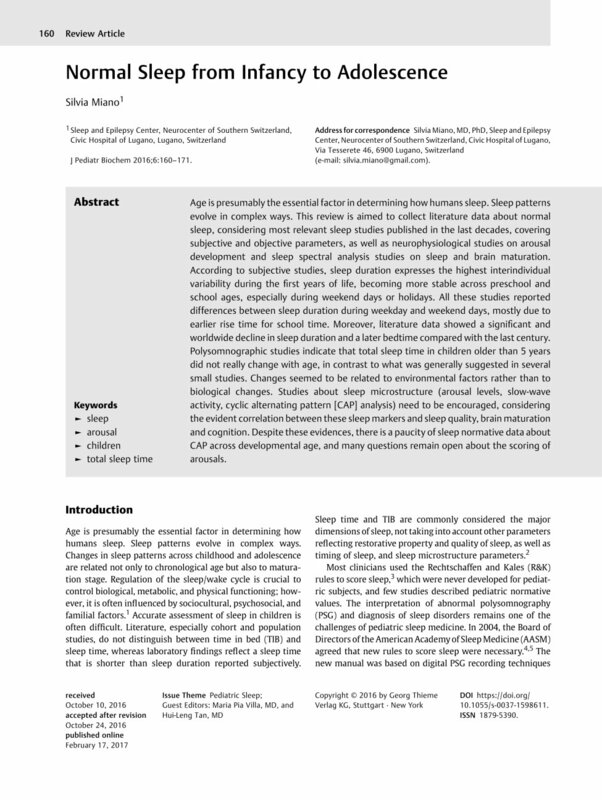 This review is aimed to collect literature data about normal sleep, considering most relevant sleep studies published in the last decades, covering subjective and objective parameters, as well as neurophysiological studies on arousal development and sleep spectral analysis studies on sleep and brain maturation. According to subjective studies, sleep duration expresses the highest interindividual variability during the first years of life, becoming more stable across preschool and school ages, especially during weekend days or holidays. All these studies reported differences between sleep duration during weekday and weekend days, mostly due to earlier rise time for school time. Moreover, literature data showed a significant and worldwide decline in sleep duration and a later bedtime compared with the last century. Polysomnographic studies indicate that total sleep time in children older than 5 years did not really change with age, in contrast to what was generally suggested in several small studies. Changes seemed to be related to environmental factors rather than to biological changes. Studies about sleep microstructure (arousal levels, slow-wave activity, cyclic alternating pattern [CAP] analysis) need to be encouraged, considering the evident correlation between these sleep markers and sleep quality, brain maturation and cognition. Despite these evidences, there is a paucity of sleep normative data about CAP across developmental age, and many questions remain open about the scoring of arousals.